ONLY 1,903 Miles! Lunar Silver Metallic exterior and Gray interior. Heated/Cooled Leather Seats, NAV, Sunroof, Back-Up Camera, Premium Sound System, Alloy Wheels, Turbo, Heated Rear Seat. SEE MORE! Leather Seats, Navigation, Sunroof, Heated Driver Seat, Heated Rear Seat, Cooled Driver Seat, Back-Up Camera, Turbocharged, Premium Sound System, Satellite Radio, iPod/MP3 Input, Onboard Communications System, Aluminum Wheels, Remote Engine Start, Dual Zone A/C MP3 Player, Keyless Entry, Child Safety Locks, Steering Wheel Controls, Electronic Stability Control. 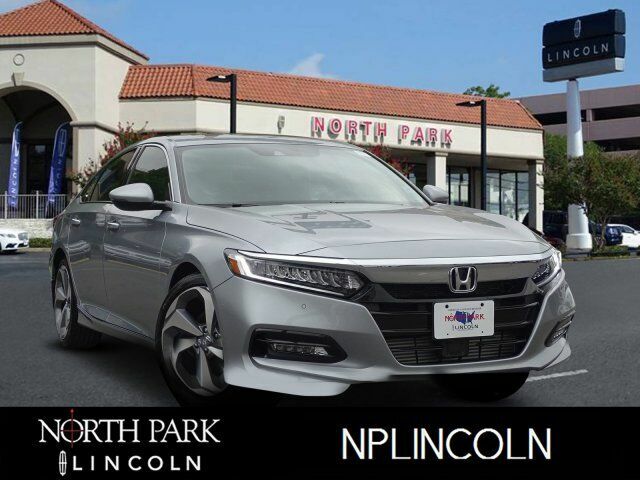 2018 Honda Accord Sedan with Lunar Silver Metallic exterior and Gray interior features a 4 Cylinder Engine with 192 HP at 5500 RPM*. CARFAX 1-Owner Edmunds.com explains The Accord has a lot of strengths on the road. The drivetrain responds quickly and provides sufficient power. The car corners well, sticking to the road with no drama, and the brakes feel natural and strong..